Cloud backup is becoming a popular alternative to traditional data backup and recovery storage media, such as tape and disk. Learn about whether cloud backup is the best data protection method for your enterprise, what to look for in a cloud storage or online data backup service, and cloud backup security best practices. Browse expert advice and tutorials on how to choose the best cloud backup solution and how to negotiate service-level agreements (SLAs) with your cloud backup provider. Read about how to manage your recovery time objectives (RTOs) and recovery point objectives (RPOs) in your cloud backup and recovery plan. Stay up to date on the latest news and listen to podcasts for more cloud backup storage technology information and resources. Which backup software is right for your business? 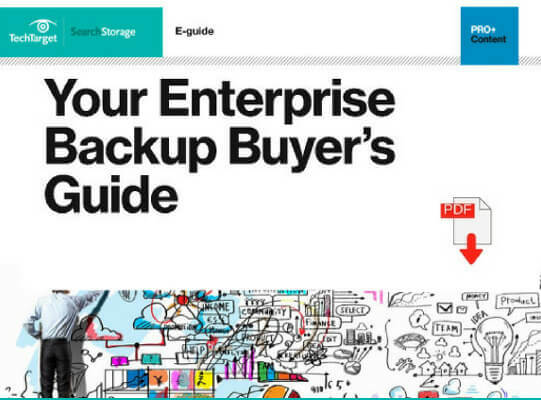 “Do I still need an enterprise-level backup software app? How can I prepare for the top challenges I may encounter when buying restore software? Which products should be on my radar?” You’ll find the answers to these queries and more, in this free, downloadable PDF. With no physical data center at launch, pharma spinout firm Bioverativ went to the cloud first and learned valuable lessons about storage protection and management. Druva sets out to fill in data protection gaps in Microsoft Office 365, providing an independent backup source for the popular software-as-a-service application.